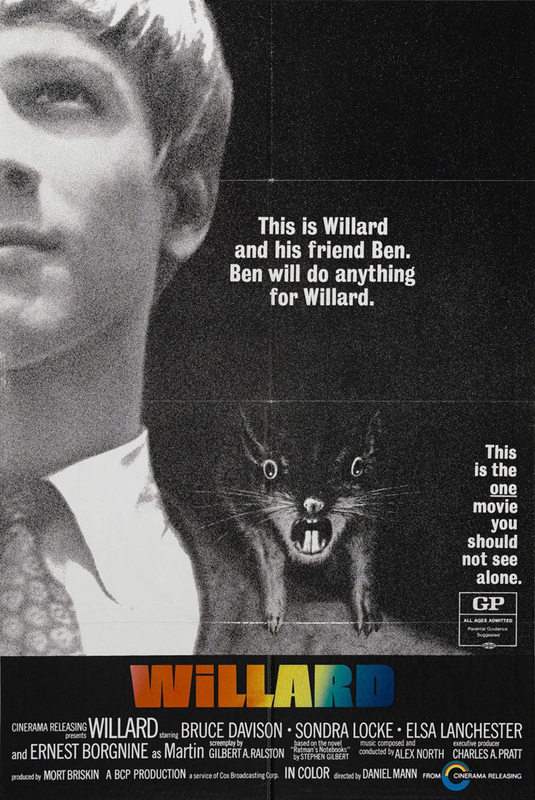 SCVHistory.com LW2747 | Film-Arts | Animal Trainer Moe DiSesso with Ben from 'Willard' (1971). Moe DiSesso with Ben from "Willard"
Newhall animal trainer Moe DiSesso (1924-2007) with Ben and other cast members from the horror/sci-fi picture, "Willard." (The 1971 original from Bing Crosby Productions, not the 2003 remake with Crispin Glover.) According to the seller, this photograph dates to 1976. Moe DiSesso trained Hollywood animal actors at his 3-acre ranch, which he called Moe's Trading Post, on The Old Road in the Newhall Pass. Veteran trainer Moe Di Sesso might have more animals than antiques on his three-acre ranch. SANTA CLARITA — Visitors to Moe Di Sesso's ranch can bid or barter for everything from handmade Native American crafts to used wet suits. Those with more serious business in mind can watch his pigs play the piano. It's hard to tell if there are more antiques or animals on the three-acre Newhall ranch. Di Sesso, 70, opens the iron gates across his driveway on weekends, hoping to lure a few passing motorists into his tiny adobe trading post. But most of his time is spent working as Hollywood's oldest active animal trainer. The quick-witted New Jersey native says he grew up in the woods and made pets out of the wildlife there by studying their habits. In his 20s, he became a sign painter — even though he couldn't read or write at the time — and a rodeo trick rider, but training animals has always been his first love. "I can train ants, or snakes or any damned thing," he says. "The whole thing is learning the behavior of the animal." Di Sesso's ranch is a step back in time, reflecting his old-fashioned methods that are dying out for newer trends. A covered wagon with an Indian mannequin inside rests at the entrance of his driveway, with a painted wood sign advertising "Moe's Trading Post" to the few passing motorists along the Old Road, which parallels the Golden State Freeway through the Newhall Pass. The wagon became a landmark to thousands of commuters when the road suddenly turned into a major freeway detour after the Northridge earthquake, but Di Sesso says the notoriety hasn't brought him any new business. "No, it hasn't, but now they all say, 'We've passed it many, many times,'" he says. But Di Sesso says the small number of visitors to his store doesn't bother him — he opened it three years ago as a hobby. Inside the ranch, a goat stands on the porch of the trading post nibbling away at a chair that has been passed down through five generations. Di Sesso's wife, Sue, shoos the animal away good-naturedly, seemingly less concerned about the condition of her great-great grandmother's chair than the fact that her husband sits there on weekends while waiting for visitors. "We used to have canvas on the wagons, but the goats ate them," she says, gesturing at what used to be a couple of covered wagons inside the ranch. "(The canvases) were OK at first, but I guess as they got older they got more tender." Di Sesso walks down a short hill from his home to the trading post, wearing three turquoise necklaces he made himself and a floral headband to hold back his long black-and-gray hair, which reaches halfway to his waist. Casually dressed in a patterned white shirt, brown pants and a multicolored vest, he fits a common image of a Native American crafts vendor. But looking at his wrinkled, tanned face indicates there is more heritage there. His father was Italian, Di Sesso explains. He thinks his mother was Native American, although she died when he was a child, and his stepmother was a Native American. "I tell everyone I'm a Wopaho," he adds. Di Sesso met his wife, Sue, when he was 39 and she 16, and they dated intermittently between his three marriages and her two. They finally married each other three years ago. "Animals made me money and my wives hated it," Di Sesso says. "I built this big, fancy compound and they wanted me to build a big, fancy house." Sue Di Sesso is no stranger to animals or movie work. She doubled for Sharon Stone "before she became famous" to handle the animal work in the 1989 movie "Scissors." She says moving to the ranch was second nature. "I've always been around animals," she says. "It just didn't seem odd to me at all." The inside of the trading post is filled mostly with what visitors would expect: jewelry, feathers, pipes, dream catchers and other Native American crafts. Many items are authentic to tradition, but a few pieces are accented with bright colors and other touches never seen in the Old West. "I have to make stuff that sells," Di Sesso admits. A second glance inside the trading post reveals a bizarre assortment of collectibles such as old record albums, aging kitchen utensils, a punching bag and a rubber alligator. "I think that one's a buck and a half," Sue Di Sesso says, pointing to the alligator and looking questioningly at her husband. "It was probably one of our props." All purchases are cash only, but Moe's is one of the few trading posts left where bartering is still allowed. "We have people trade jackets for vests and some fur pieces were traded in for necklaces," Sue Di Sesso says. "One woman traded a decorated cow's head for a spear." The more discerning might notice a glass case near the front door where several museum-quality pieces are stored, such as a hatchet used by Running Bear, an early-19th-Century Native American chief. Moe Di Sesso says the hatchet is probably worth about $3,000, but none of the items in the case are for sale. Animal trainer Moe DiSesso, who trained such notable animal stars as Ben the rat and "Annie's" dog Sandy, died July 2 in Newhall, Calif. He was 83. Services will be held at 11 a.m. Saturday, July 14 at the Newhall Church of Nazarene, 23857 The Old Rd., Newhall. DiSesso won 11 Patsy awards for animal performers for the creatures he trained. He worked with trainer Frank Inn to train the popular Arnold of "Green Acres," winning three Patsys for the collaboration. He trained over 600 rats for the two rodent horror hits, winning a Patsy for directing Ben the rat in "Willard" and another for sequel "Ben." DiSesso also trained other well-known critters including Sandy the dog for the film "Annie" and Zorro the raccoon on "Lassie." His raven, Jim Jr., appeared in more than 125 projects, including feature "The Raven" with Vincent Price and Jack Nicholson. His German shepherds appeared in TV shows and films such as "The Bionic Woman," "Rin Tin Tin," "The Hills Have Eyes" and "Devil Dog: the Hound of Hell." 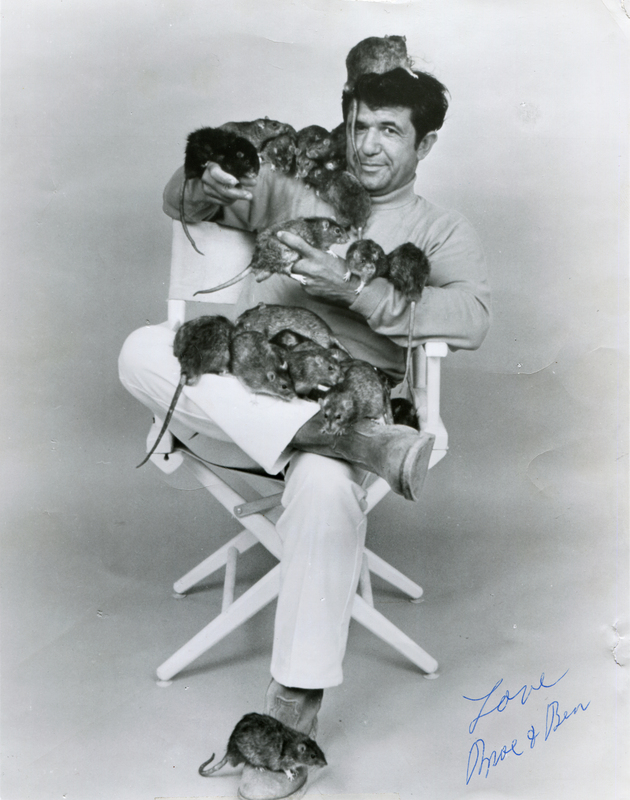 DiSesso was also the official animal trainer for TV shows including "Seinfeld," "Murphy Brown" and "3rd Rock from the Sun" and for films including "Swiss Family Robinson," "The Gazebo" and "My Stepmother was an Alien." The trainer started working with animals after being injured in WWII, doing rodeo trick riding and horse training. When an animal trainer he was working with gave him a couple of raven eggs, his training business was launched when raven Jim Jr. was hatched. He also acted in films including "The Ten Commandments," "The Conquerors" with John Wayne, and on TV shows including "Seinfeld," "Quantum Leap" and Bill Burrud's "Animal World," on which he was a co-producer. More recently DiSesso appeared in Kid Rock's musicvideo "Cowboy" and the Ludacris musicvideo "Act a Fool," both filmed at his ranch, Moe's Trading Post, in Newhall. He is survived by his wife Sue, two sons, a stepson, a stepdaughter, three grandchildren and two great-grandchildren. LW2747: 19200 dpi jpeg from original photograph purchased 2015 by Leon Worden.